To see a bigger version on YouTube, click the movie when it’s playing. Can’t access YouTube? Here’s a Vimeo version. To practice steering your client away from an information dump, you might try this challenge. I gave this presentation a couple of weeks ago at the “Fresh Look at Instructional Design” session with Patrick Dunn and Clive Shepherd, sponsored by the Elearning Network and ALT. You can see Patrick’s presentation in his blog, and you can see the whole Elluminate recording, including a lively chat and lots of questions, here. P.S. to email readers: If you’ve subscribed to this blog through email, you’ve probably noticed that the service that delivers it to your mailbox has delivered a bundle of posts the last two times. I’m sorry about that, and if it happens with this post, I’ll switch you over to a better system. You won’t need to do anything. If your In box is getting too cluttered with blogs, consider subscribing to them through a feed reader instead of email. To find out how, see this fun video. I just found the link to this item on the Making Change feed. Thank you. Thank you. Thank you. Thank you. Thank you. Thank you. Brilliant advice that applies to so many management situations. This is sound advice and a current issue in my organisation. We are dumped with information and have to turn that into a learning course and we wonder why it is not effective and the learners hate the training. One of the major issues as I see it, is that so often we (Instructional Designers) are placed within a Learning and Development department. So by the time people within an organisation come to us, they already have it in their heads that training is the solution. I believe that Instructional Designers should act as an information funnel, with training being just one of the available outcomes based on needs analysis. Until organisations recognise this, and separate us out from the training function, we will always have an uphill battle getting people to “unlearn” the concept that all performance and behavioural issues can be fixed with a training course. Good presentation – nicely explains the shift in mentality that I’m sure many of us struggle with regularly. As a Moodle practitioner its also nice to see that the primary focus of Moodle, i.e. activities rather than content creation, backs up this concept of not trying to always be the ‘font of all knowledge’, but instead to help people to learn how to learn. We share a similar perspective, we exchanged emails a few years ago on activity centric design. You’ve carried the message much more clearly than I:) Well developed and articulated. Is my presumption that the model above only applies to organisational elearning? I work as a developer creating educational content for vocational training organisations. As such, I create course content but have no say in how the content is used. While I appreciate the point you are making, I can’t see how it can applied to my situation. Lisa, I agree that many IDs have to struggle to be recognized as performance consultants because they’ve been put in a narrow box by their organizations. It’s part of the larger problem of over-specialization, where every problem supposedly requires a team of super-narrowly defined experts rather than just one or two generalists who can address the bigger picture. Alfred, my blog and this presentation address elearning in the business world, so my points might not apply to education, where the goals are often different. Thank you for the insightful presentation, Cathy. When addressing the potential causes of performance issues, organisational leaders need to determine if it is a training issue or an effort issue. It comes down to the age-old debate of effort versus ability. In order for us to develop material that truly addresses a measurable goal, we have to be sure that it is actually a training issue. We can have the best designed training in the world, but if the performance issues was caused by a different factor, the training process will be futile. I am relatively new to the eLearning world and am currently studying instructional design in a Master’s program. This week’s video post “The big mistake in eLearning” was quite insightful for me. In particular, I found the tips on handling the task of what is seemingly an “information dump” and transforming it into an effective eLearning module to be very interesting. Your recommendation of asking directed questions to determine goals and “real-life” behaviors that the requested training should address gives me a better idea of where to begin with a new course when one is requested of me. This is often a challenge I face when creating new learning modules for the topics and tasks I’m given to work with. I also find the perspective of bringing experiential activities to the forefront of the learning instead of focusing simply on passing along information to the learners. The learning by practice approach seems to be one that would be much more effective than the standard information dissemination and review approach. I’ll be sure to visit your site often for additional insight and tips. Like Kassie, above, I, too, am a Masters student entering the world of instructional design. This week in our program we learned about how the brain effectively processes information and problem solving. This video post exemplifies what I learned. You helped me understand that it’s not all about the information. It’s about what information is needed for a specific activity or behavior. I believe that the knowledge that I gained by watching your video will stay with me and help me as I move forward and learn how to design effective instruction or as you put it… design an experience. Now as I approach an ID project, I will first take a look at what is the goal and what are the activities that will help people practice the behaviors to reach the goal. This approach seems much more attainable and effective than… here’s a bunch of information… we need a course that “dumps” this information on our learners. People don’t want to just learn a bunch of information. They want to relate to what specific information they need to perform a specific function. Thank you so much for posting this video! I will definitely take this knowledge with me and apply it as I become an ID. I appreciate this approach which is relevant not only to eLearning design but as a general principle for learning design in the business context. I have worked through your eLearning Blueprint so this post was good reinforcement. I want to pose a question, however, for you and your readers. I am working on a project now where it is much more difficult to define & measure the business goal than in the case of increasing widget sales. My client wants to improve the rate of technology adoption by farmers. My ‘students’ are those who work with farmers to encourage adoption. The skill set is in the fields of communication, persuasion, attitude change. 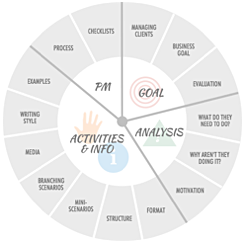 My question is, how do we define a measurable business goal in such an abstract skills area? Sure, the goal is to increase adoption rates, and I can identify what learners must ‘do’ plus build some nice activities. Your principles work fine – but how do I nail the measurement? Thanks for your thoughts, Bruce. 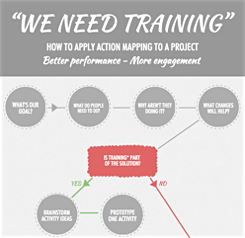 Alfred – I work in vocational education too and apply action mapping to many of my projects. For me – most of this is competency based training so much of the activitiy is desribed in the training package as performance criteria. 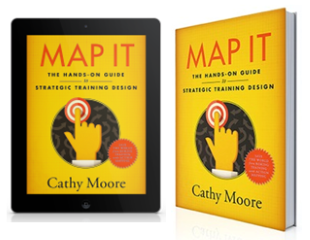 I have found Cathy’s process very useful in avoiding information dump and guiding my clients to only include the informatin that is relevant to the PC.. not becuase they like it! I always love reading your blog after resurfacing when client projects are done. I can relate our sound advice to recent projects. In this instance I wonder about using this model in compliance training. More often than not the goal is for learners NOT to do something. Posted a link to your presentation on our intranet. Keep up the good work! Ryan, I agree that if training won’t affect the root cause of the performance issue, we’re wasting our time. In my May 19 post I include a video that shows a visual tool that can help you get clients to focus on the real cause of the problem. I think that if “effort” is a cause, it could conceivably be addressed through some activities that show why the learners should care–sort of motivational training. Erin and Kassie, I hope you enjoy your new field. It can be a lot of fun to find the most engaging and memorable ways to help people learn. Bruce, for overall measurement, there’s always the adoption rates. You could see if you can say something like, “Before we trained our farmer-trainers, X% of the farmers had adopted the technology. After the training, Y% have adopted it.” That would measure the business goal of the training. For measuring the performance of specific trainers, in addition to mapping adoption rates to each trainer, could you gather feedback from the farmers that they train? For example, in a perfect world, you could have the farmers complete a survey about their attitudes regarding the technology *before* the trainers meet with them. Then, maybe a week after the training, you could measure the farmers’ attitudes about the tech and their plans for incorporating it, though measuring “plans” is notoriously fuzzy. That would at least show you if attitudes are shifting. Tracy, I agree that the performance criteria spelled out by vocational education organizations are a great source of goals and activities. Thanks for pointing that out. Cate, for compliance training, it might help to phrase the actions as what learners should do, rather than what they shouldn’t. It can help to focus on the situations that learners must respond to in the real world and show them the results of their decisions. For example, when faced with situation X, they could do Y (bad!) or Z (good!). So rather than telling them, “Don’t do Y,” we could put them in situations where they might choose to do Y and then find out from the results that they made a poor choice. For example, in a privacy course, an action could be, “When taking data off the premises, use an encrypted device” and the associated activity could describe a character who wants to bring a big file home and needs to decide how to do it. Once the learner makes their choice, you could have the character lose the device. If the learner chose an unencrypted device, bad things happen. The feedback points out that only encrypted devices should be used. Cathy, just recently discovered your Making Change blog and it is excellent. I found your “biggest mistake in elearning video” very compelling. It reminds me of so many scenarios at my company. As a way to address this issue, we recently have experimented with using “Job Instructional Training” as taught in industry by companies such as Toyota. For a new standardized process, the steps are spelled out in a straightforward way, along with information on how to do each step, as well as why you perform that step in the specified manner. The training is conducted in a step-wise fashion. First, the instructor demonstrates the new process describing each individual step as it is performed. Second, the process is repeated but the instructor details specifically how to perform each step. Third, the process is repeated with the instructor emphasizing why the step is performed the way it is. (for safety,quality, etc.) This process is then repeated by the student in a teach-back manner, going through the three iterations with the instructor. The early feedback from staff has been positive, but this approach is very time consuming from a resource standpoint when you have 5000 employees. We would like to take the advantages of this approach and incorporate it into some type of elearning strategy that would be less resource intensive. I was wondering if anyone had any specific advice or might point us in the right direction? I like your analogy of the development process of a widget and how too much information is a bad thing. I recently completed an assignment in my online learning course that pertained to learning processes of the brain and how easily something is stored and retrieved (Ormrod, 2010). I agree that an “information dump” will ultimately lead to too much information for the brain to handle and ultimately prevent the learner from learning. Your point about making elearning less information-centric and more activity based and how to use “job-aids” to find the information they need makes perfect sense and hopefully I can utilize these methods as an instructional designer. For example, if you do this online, a character who has a job similar to the learner’s job applies the process to be taught, thinking out loud to model the decisions that happen at each step. This demonstration could be made more interactive and memorable by having the learner try to identify why each step is done the way it is, with feedback providing the correct explanation. Next, the character starts the process but the learner has to finish it. This repeats a few times, with the learner doing more of the process each time, until the learner is doing it solo. For example, if it’s a 7-step process, after the initial demo, the character completes steps 1-5, and the learner does 6 and 7 with help from the character. Next, the character completes only steps 1-3, and the learner finishes, and so forth. If there are some steps that are trickier than others, the fading could be organized so the learner spends most of their time on the tricky steps. Does anyone else have any ideas? This is a challenge that a lot of us face. Dean, thanks for your comment. If you’re interested in more information about the many types of job aids that elearning could incorporate, you might look up “performance support” and see the book “Job Aids and Performance Support” by Allison Rossett and Lisa Schafer. Thank you Cathy! These are my feelings exactly! I call this the learning strategy. All too often learning initiatives fail because everything is trained to the nth degree as oppose to training learners how to be self-sufficient and use tools around them. @Alfred – I work in both the Corporate and VET worlds. I’ve found that this approach practical and valuable in both. @ Bruce – in my experience, there is a definition of what success looks like even when the initial goal is abstract. Getting this defined is critical as part of the TNA phase of Instructional Design. If you don’t get this defined more clearly, you may find that project is doomed for failure because the expectations were never clearly outlined. I want to thank you for your insight and humor while presenting “The big mistake to elearning.” I found myself smirking the entire way and while I am new to the field as an Instructional Designer I giggled over being on the receiving end of all those training methods you mentioned like having a narrator read each bullets if they only they displayed the humor you offer then maybe it would be more engaging! In your video I get a kick by reading that your bullets state “Adults can read on their own. Really!” That is hilarious and ties into your posted Sept 7th article “Do we really need narration?” From what I came across so far through your blog you have quite a bit of experience in the field so I am happy to have come across your materials and articles – all of the graphics placed within your page to match your posts are quite clever and that is much appreciated. Again being new to the field of instructional design I feel like being a sponge towards the correct methods of designing but so far my experience has been exactly what you have made reference to as ”not very deep” methods, for years I have been utilizing corporate eLearning / skillsoft strategies imposed by the companies I work for to get the corporate message out as they pushed elearning materials. I always appreciate an experienced profession reiterating what the job means and this video started off with the definition of an Instructional Designer. I believe that the knowledge that I gained by watching your video will provide better experiences in my professional field and help me progress as I bring new innovative methods to the table rather than the materials that have been in place and begin to effectively instruct by starting with “designing an experience” and not put lipstick on a pig anymore! Thank you Cathy! These are my feelings exactly! I call this the learning strategy. All too often learning initiatives fail because everything is trained to the nth degree as oppose to training learners how to be self-sufficient and use tools around them. @Alfred – I work in both the Corporate and VET worlds. I’ve found that this approach practical and valuable in both. @ Bruce – in my experience, there is a definition of what success looks like even when the initial goal is abstract. Getting this defined is critical as part of the TNA phase of Instructional Design. If you don’t get this defined more clearly, you may find that project is doomed for failure because the expectations were never clearly outlined. Watching the video The Big Mistake in Elearning gave me a clear connection between my studies in Instructional Design and the real world. This week my studies have taken me deep into the human brain as our class explores the brain’s information processing functions. In my opinion, your description of the process of planning and executing authentic and valuable instruction is similar to the meta-cognition strategies. The meta-cogniton strategy includes, as did your approach, for the planning for instruction, thinking of the learning process, and evaluating the learning process. When addressing the problem to be solved with questions like, “What is the goal of this instruction?”, “Is it a measureable goal?” and “Will training help meet the objective?” follow suite with the Information processing functions, of which the meta-cognition strategy compliments. My own personal connection to the breaking down of the activities needed to meet a goal will help me to retain the information in your video as to aid my future studies in the field of Instructional Design. Lastly, having experienced, in recent days, an absolute onslaught of information overload, as I explore the world of blogging as it relates to Instructional Design, I truly connect with your videos final thoughts on relying on activities based learning to provide the needed information and real world connections to more information through those activities. I hope my quest for Instructional Design Blogs, to follow and read, will follow such advice. I think having found your blog I am one step closer to meeting that goal. Thank you for sharing your informative video and it is of with great anticipation that I readily discover the jewels to be found in the rest of your blog. 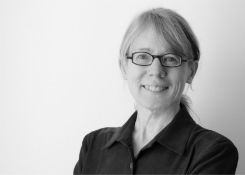 I’ve been blogging all day to find topics relating to my career in Instructional Design. I think this is by far the best one yet. This is worth sharing with my colleagues. Thanks for sharing. Very helpful presentation. I will share with my friend. Thanks a lot. Cathy, what an excellent display of using divergent thinking in the field of Instructional Design! Although I’m just getting into the field, I can see how “information dumping” can be a huge blocker to the creative process that good instructional design requires. Enter Brainstorming! Working collaboratively with an organization to show people how to use the job aids or provide experiences using activities gets them thinking instead of just trying to remember facts, which will likely be forgotten a few hours after dumping the information on them. The video really made me think of how to use those metacognitive strategies to effectively design instruction. Thank you! It is entertaining as well as adreneline pumping. I have ideas that can change the entire eLearning Industry. It will takeeLearning by storm. It will not only add value to the whole Industry but will help communities, societies, individuals and world-wide population on learning and understanding many professional and personal aspects on growth and self development respectively. If you need the recording of this e-learning courses Escena Digital can record by 0,09 USD. 5000 voiceovers/ 60 different languages. What do you think about learning management systems (LMSs)? Any thoughts on if there are mistakes there? Hi Cathy thanks for the great posting. i am clear now if any issues comes under e learning scenario.